If you know how light interacts with objects, you can explain why objects such as flowers have different colors. The color of any object depends on the material the object is made of and the color of light striking the object. 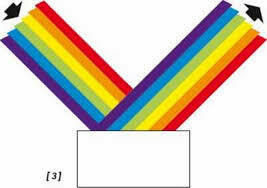 The color of an opaque object depends on the wavelengths of light that the object reflects. Every opaque object absorbs some wavelengths of light and reflects others. The color of an opaque object is the color of the light it reflects. For example, look at the apple shown at the top of Figure 2. The apple appears red because it reflects red wavelengths of light. The apple absorbs the other colors of light. The leaf looks green because it reflects green light and absorbs the other colors. Objects can appear to change color if you view them in a different color of light. In red light, the apple appears red because there is red light for it to reflect. But the leaf appears black because there is no green light to reflect. 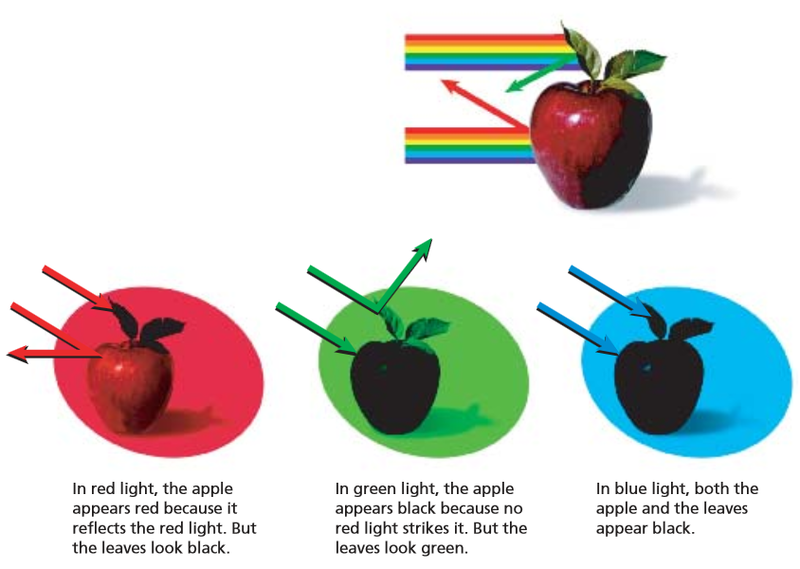 In green light, the leaf looks green but the apple looks black. And in blue light, both the apple and the leaf look black. Materials that are transparent or translucent allow only certain colors of light to pass through them. They reflect or absorb the other colors. The color of a transparent or translucent object is the color of the light it transmits. For example, when white light shines through a transparent blue glass, the glass appears blue because it transmits blue light. Transparent or translucent materials are used to make color filters. For example, a piece of glass or plastic that allows only red light to pass through is a red color filter. 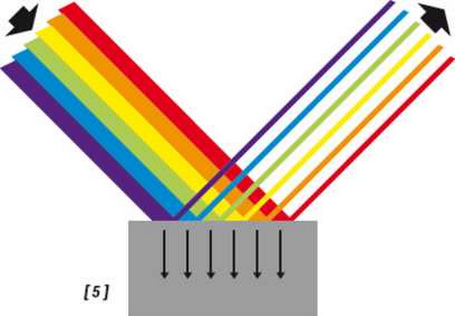 When you look at an object through a color filter, the color of the object may appear different than when you see the object in white light, as shown in Figure 3. The lenses in sunglasses often are color filters. For example, lenses that are tinted yellow are yellow filters. Lenses that are tinted green are green filters. When you put on these tinted sunglasses, some objects appear to change color. The color you see depends on the color of the filter and on the color that the object appears in white light.